Sunday, November 18, at 2:00 P.M.
Cass Crifasi is an Assistant Professor of Health Policy and Management at Johns Hopkins where she serves as the Deputy Director of the Center for Gun Policy and Research. 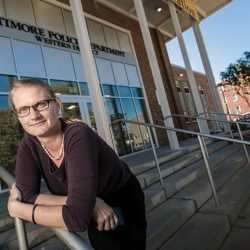 She is also the Deputy Director of the Johns Hopkins-Baltimore Collaborative for Violence Reduction. Dr. Crifasi’s research focuses broadly on public safety including injury epidemiology and prevention, gun violence, attitudes and behaviors of gun owners, and underground gun markets. On a Friday morning in June, Cassandra Crifasi loads a 9mm semi-automatic pistol, takes aim, pulls the trigger—and 25 feet away, a paper target takes a hit to the chest. Crifasi peers through the gunsight, then pulls the trigger again, and again. The shots are deafening, bouncing off the concrete walls of this gun range tucked into a Severna Park, Maryland, strip mall. Neither the noise nor the kick from the gun rattles Crifasi. She shoots twice a month, so she’s used to it. When the magazine is empty she reloads.